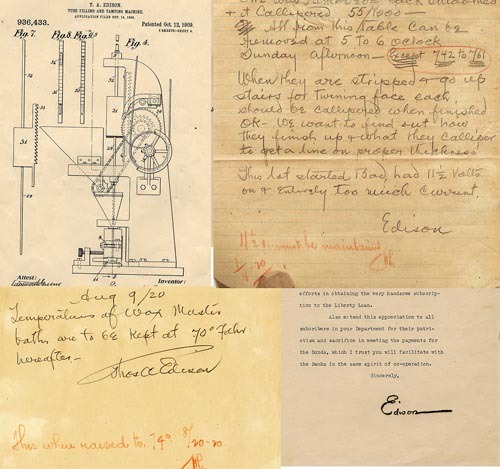 Trivia – upon dying, guess how many pages of inventor Thomas Edison’s notes were found? Answer – over 5,000,000. Edison’s diary notes are maintained in the US Historical Record. Captured in great detail are his thoughts on perfecting the light bulb and the attributes of electric lighting. Researching about his life, Edison’s love for reading becomes immediately apparent. His personal library at the time of his death consisted of over 10,000 books. Author Jim Powell notes that Edison, a school dropout, had read the likes of Shakespeare, Dickens, David Hume and many other before the age of 12. Edison was self taught on the advanced components of chemistry through extensive reading and research. Thanks in part to this, Edison created the first high resistance, incandescent electric light. This is just one of his 1,093 patents. Imagine what he could have done had he been blessed with the social media and online tools of today’s generation? Just think about how he could have benefitted from crowdsourcing his ideas, networking with other great inventors on LinkedIn or followed thought leaders on Twitter. What about you? You have these tools at the click of a mouse or touch of an iPad app. Are you taking advantage of what is offered for professional development and personal knowledge? Just as an athlete trains for a sporting match or an actress / actor rehearses for a performance, so too must working professionals come up with an exercise regime. Professors Bill Fischer and Andy Boynton describe this in great detail in their brilliant book The Idea Hunter. According to the authors, one of the common characteristics of successful idea generators is their commitment to “exercising” regularly. Social media is an ideal “gym” for this regular professional learning. Many rightfully concentrate on using social media to communicate a message and build up a brand. Frequently lost in the social media equation is its power to provide learning, networking and enrichment. If you are not sure what to think about social media or how to use it, then I have a challenge for you. Sign up for a Twitter account or re-consider your approach on the channel (other social media sites could also do the trick). Make it a goal to tweet one new thing you learned today related to your expertise / professional interests. Develop your own social media learning diary. If you can’t think about one new area related to your expertise, then do some investigation on social media or elsewhere on the web and find a nugget of information that you weren’t aware of. Then go ahead and tweet out that information. I think if you proceed with that process – committing to post one new learning each day – you will be taking part in a successful learning exercise regime. Try it out for 30 days and then afterwards take 10 minutes and review your tweets from the past month. The cost is a just a few minutes of your time which will surely result in ROI. Free education should never go to waste! While your notes will not consist of diagrams that Edison eventually used turn on the light switch, you will be able to review some of your own latest insights which can have a profound effect on how you go about your gig. Just as Thomas Edison soaked in knowledge through chemistry books, think about what sources you refer to for daily professional inspiration. How much time do you spend reading new information related to your profession? Is it a part of your daily routine? Think about the online tools available and different social media channels on the web. Make it a habit to dedicate a specific amount of time to reading the latest information about your field. Set up Twitter lists and create RSS feeds that will facilitate the process. We should all follow the Wizard of Menlo Park’s example by dedicating time to professional enrichment. Who knows what breakthroughs it could lead to for yourself, your team and your organization?